Prince Albert Development Corporation (PADC) is the General Partner acting on behalf of twelve (12) First Nations that comprise the Prince Albert First Nations Business Development Limited Partnership (PAFNBDLP). Each First Nation owns an equal 1/12 interest in PADC and PAFNBDLP.� PADC's business operations and investments are focused in the hospitality, real estate and aviation industries. Peter Ballantyne Developments Limited Partnership (PBDLP) is the "for profit" business investment and development division of the Peter Ballantyne Cree Nation. PBDLP was formed in 1995 and is the umbrella organization that holds most all of the corporate business investments; it is responsible for the overall management of the business portfolio. Grab Holdings is majority owned by the Eikel family and has been active in the north for over 25 years now. Athabasca Basin Development Limited Partnership (ABDLP) is the investment arm owned by the 7 Athabasca communities. The limited partnership was formed in 2002 and currently is focused on providing construction and operational services to the mining and exploration sector and government. In a company that has seen continuing changes since it began, three factors have remained constant - meeting customer needs, taking the risks required to grow and the Eikel name. 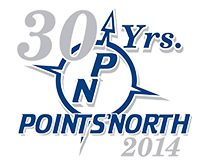 When Points North Freight Forwarding was incorporated in 1984, the ownership was split between Dawn Air and Nipawin Air. Dawn Air owners included George and Andy Eikel, both Norcanair veterans. 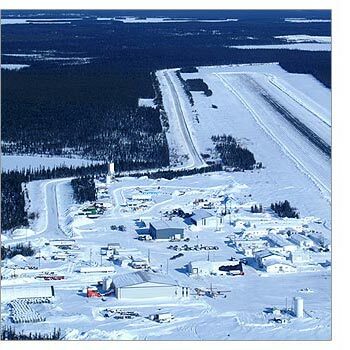 Points North president George Eikel recalls, "when we started times were hard in the north and it wasn't the best time to be in the aviation business. Here we were in the north and in aviation. But we saw a need we could fill and we believed in the future." The first step was the company's facility at Points North Landing. Andy Eikel recalls the location as "just bush, trees, rock and a little lake. But we knew if we moved to the end of the road we could build something that could grow." The resulting warehousing and distribution facility fit the Government's vision and saw solid support from the mining industry. Facilities at Points North Landing grew through the late 1980's and early 1990's. The airstrip was lengthened twice and accommodation capacity was increased. The company also completed a 12,360 square foot hangar. Another important addition was the third Eikel brother. Norm Eikel left the Federal Business Development Bank to oversee the company's finance and administration. Points North continued to grow and diversify through partnerships and its own investments. Points North Construction was formed in 1994 with Graham Construction. 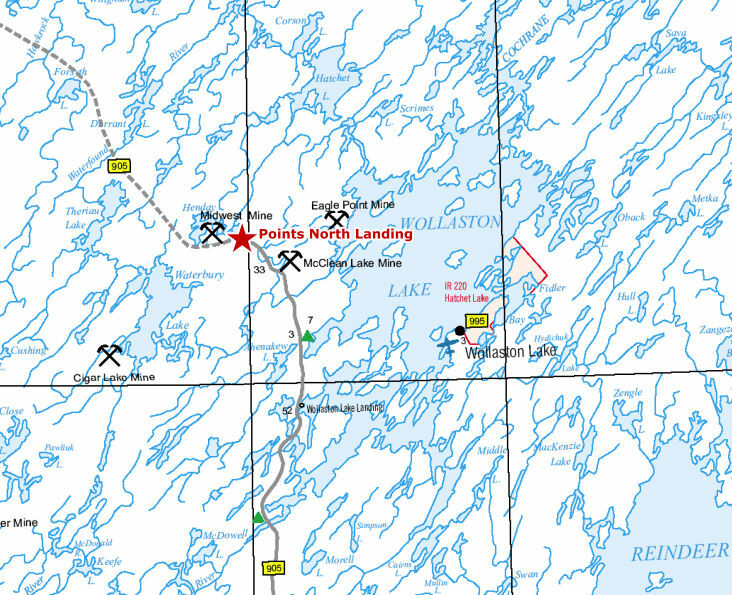 In 1995, Cogema became part owner of the airstrip at Points North Landing. In the late 1990s, a major new aircraft investment, a changing northern economy and alternatives to air freight led to major financial challenges. Points North has since recovered from a difficult start to the new century. Customer demand has led to growing fuel and accommodation business. Retail lumber sales are the latest response to changing customer needs. 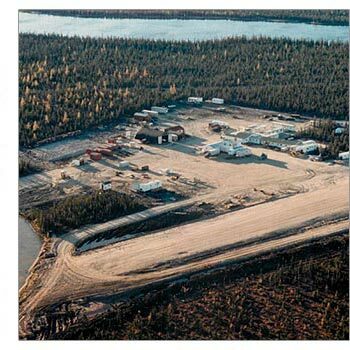 In 2006, the Athabasca Basin Development Limited Partnership acquired 50% ownership in Points North Freight Forwarding, providing capital to support future expansion. The Eikel's credit much of Points North's success to their relationship as brothers and business partners. "We work together, we relax together ... and we all feel a tie to the north that goes way beyond business." says George. Today, a new generation of Eikels are making their mark on the company. Andy's son Mark and Norm's son Blaine both hold senior positions in Points North. The branding to Points North Group of Companies has allowed the company to incorporate the myriad of services that we have to offer. While none of the brothers will guess what directions the company might take in the next 25 years, it's a safe bet that the Eikel name and Points North will be linked for generations to come. As Norm Eikel says, "We feel we've been and will continue to be an important part of the infrastructure of the north."